TPPI News – Power to the Public! 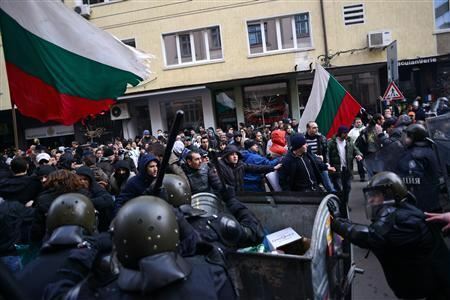 The people of Bulgaria are waking up to the raw deal they’ve been dealt by electricity privatization. It’s not free enterprise, because there is no competition. It’s just corporate monopoly. Now they are demanding their power back. From Common Dreams, an excellent article about the success of green energy initiatives in Germany. This is what can be accomplished when utilities function in the public interest rather than for corporate profit. There is no debate on climate change in Germany. The temperature for the past 10 months has been three degrees above average and we’re again on course for the warmest year on record. There’s no dispute among Germans as to whether this change is man-made, or that we contribute to it and need to stop accelerating the process. The money the government uses to pay producers comes from a monthly surcharge on utility bills that everyone pays, similar to a rebate. Ratepayers pay an additional cost for the renewable energy fund and then get that money back from the government, at a profit, if they are producing their own energy. In the end, ratepayers control the program, not the government. This adds consistency, Davidson says. If the government itself paid, it would be easy for a new finance minister to cut the program upon taking office. Funding is not at the whim of politicians as it is in the U.S. The press conference the foundation organized with InsideClimate News comes two weeks after one of the biggest storms in U.S. history and sits in the shadow of the Keystone XL Pipeline, which would unlock the world’s second-largest oil reserve in Canada. The event also comes one day after a report that says that the U.S. is on track to become the leading oil and gas producer by 2020, which suggests that the U.S. has the capability to match Germany’s green movement, but is instead using its resources to deepen its dependency on fossil fuels. OLYMPIA, Wash. – State regulators have fined Puget Sound Energy (PSE) $250,000 for violating a 2010 order that required the utility to review and correct specific customer accounts. The Washington Utilities and Transportation Commission (UTC) has approved a multi-party settlement of a complaint that alleged 515 violations of the 2010 order. The parties include: commission staff, PSE, the Public Counsel Section of the Attorney General’s Office, and The Energy Project, a nonprofit group that represents low-income people. The UTC originally penalized the company $104,300 in October 2010 for improperly handling accounts of customers, including many low-income customers, disconnected for nonpayment. In addition to that penalty, the company was ordered to make corrections to 26 specific customer accounts identified by UTC staff. In the 2010 order, the UTC also penalized the company for improperly applying energy assistance pledge funds made to low-income customers’ accounts. Energy assistance pledges are intended to help consumers keep the lights and heat on during the winter months. Commission staff cited PSE for improperly applying those funds to a prior balance, which led to additional threats of disconnection for customers. PSE has now provided refunds and credits to the mishandled customer accounts, and changed its billing practices to ensure that customer payments are applied correctly. The company also agreed to make a $75,000 contribution to its low-income assistance program. The utility is not allowed to pass the penalty costs to customers through rates. Bellevue-based PSE serves more than 1 million electric customers and about 785,000 natural gas customers, primarily in the Puget Sound region of Western Washington. The UTC is the three-member state agency in charge of regulating the private, investor-owned electric and natural gas utilities in Washington. It is the commission’s responsibility to ensure regulated companies provide safe and reliable service to customers at reasonable rates, while allowing them the opportunity to earn a fair profit. Editor’s note: A copy of the penalty complaint may be found at www.utc.wa.gov/110808. In the story, it was mentioned that WUTC is responsible for ensuring that private monopoly utilities provide safe and reliable service while allowing them to earn a fair profit. Does it seem fair to have been paying the highest rates, yet receive service with one of the worst reliability ratings? JACK JANDA | Shelton (Janda is a commissioner of Mason County PUD 1)I am writing on my own behalf to your readers in hopes to inform them about a Public Utility District. Unlike private utilities, PUDs are run by an elected, nonpartisan board of commissioners who are directly accountable to the voters. Commissioners meet at least monthly in open meetings where members of the public can observe and participate in the decision-making process. PUDs are not-for-profit utilities owned by the community. Consequently, public utility district rates are generally lower – and service values higher – than investor-owned utilities. PUDs also pay state and local taxes that help pay for schools and other community services; sponsor programs to encourage conservation of power and water; and take part in other outreach programs. Olympia Power & Light endorses Prop. 1! We are proud to receive the editorial endorsement of Olympia Power & Light, a newspaper which has built its reputation on insightful and in-depth local political coverage. While we may never get the support of Tacoma-based daily advertising circulars with lucrative PSE advertising contracts, we know that honest journalists are in our corner. Thank you, OP&L! There are two key reasons to support public power. The first is responsiveness and accountability. Private companies are capable of providing excellent products and excellent customer service when they have a financial incentive to do so. If they must convince customers to buy their product, and then convince them to buy it again and again, they must keep those customers happy. But that changes when the private company has a monopoly. When the customer literally has no choice other than to buy from a certain company, then – from a purely practical business perspective – any effort to please the customer is a waste of money. Puget Sound Energy is a monopoly, the only electric power provider in Thurston County. (Sure, a few people live off the grid, but that’s not a reasonable option for most.) PSE’s goal as a company is to maximize income and minimize costs, including the cost of pleasing you. Sure, when the power goes out, they have to get it back on, but they don’t have to do it quickly. They don’t have to schedule an appointment at a time convenient for you, or act promptly to fix your billing problem, or open up their internal discussions to public review. It’s not that PSE directors don’t care about you. It’s that they have a financial incentive not to care. They are accountable to shareholders, not to you. You just get to pay your bill month after month. So whaddaya gonna do about it? Buy electricity from someone else? A public electric utility is run by elected commissioners. If the customers (voters) get unhappy, they can vote out the board of directors (commissioners). Democracy never fully pleases everyone, but in this case democratic accountability creates a powerful incentive to be responsive to customer needs. The second reason to support public power can best be summed up by this statistic: 22 out of 22. That is, there are 22 public utilities that currently provide electricity to local customers in Washington State, and all 22 of them charge lower rates than PSE. The explanation is simple. Public utilities can buy power at lower cost, can borrow money at lower cost, and have no profit margin. It’s a public utility district trifecta. PSE has tried to argue that government is so inefficient that it will still end up with higher rates. However, that hasn’t happened so far, 22 out of 22 times. We’ll say it again, slowly: Public utilities… charge… lower… electric… rates… than… PSE. Public Power campaign mailer debuts! It took every penny we could scrape up or borrow, and we were able to put out a mailer to about 50,000 voters, concentrating on areas of the county where we have not been able to canvass yet. We’re proud of it, and think it does a good job of presenting our case. Please take a look! Public Power mailer – front. 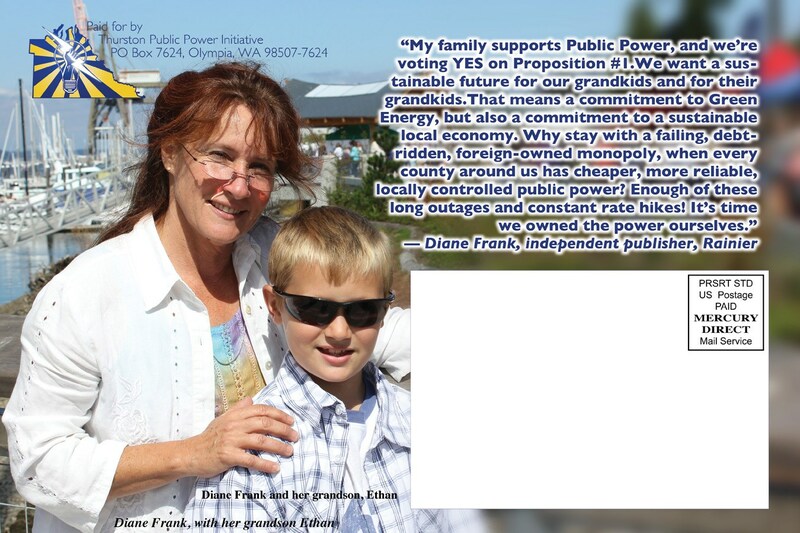 Public Power mailer – back. A proven strategy, used to defeat statewide initiatives and referendums: Create chaos and doubt, then conquer. If doubts are planted in voters’ heads, they will vote no, even if those doubts are false and have no basis in fact. 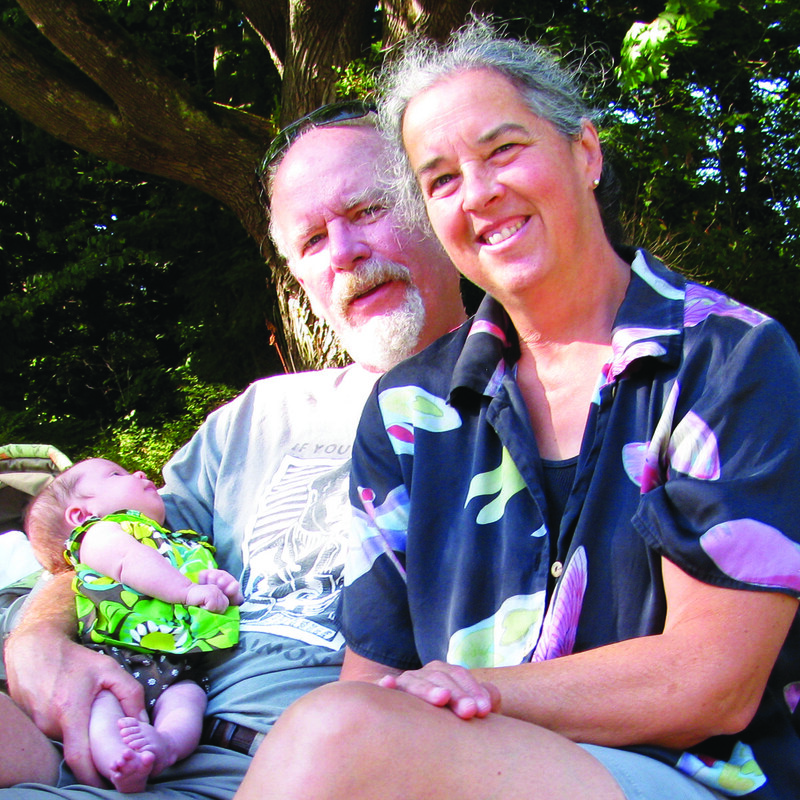 Dave Siemens and Maggie Roberts, and granddaughter Claire. My power has been out seven times since the storm last January. Sixteen years ago when I moved into my home, the power was out 17 times. Most years I average eight to 12 outages. In the same geographical area of the county and down the road a bit, my neighbors have just a few outages a year. They are served by a public utility district.I worked for years in Mason County – and was served by another public utility district – I had two outages during work hours in 15 years. I can’t help but think that if the profits gained by Puget Sound Energy were used to fix the infrastructure in my area of the county, that have clearly been a problem for years – perhaps I would not be so consistently without power. Please do not be afraid of change. Just look at the service records of the other PUDs in our state (look at the rates too while your at it). Proposition 1 allows (not requires) us to acquire and create a PUD for Thurston County. PSE Disinfo Campaign Tops $Half-Million! To no one’s surprise, PSE’s campaign has distinguished itself, not only for the sheer brazenness of its misinformation, but also by its unprecedented spending. Prior to this campaign, the most expensive ever run in Thurston County was Kevin O’Sullivan’s failed bid for a County Commission seat. He spent around $110,000. PSE’s front group, the Alliance to Protect Thurston Power (APTP), will have spent more than five times that amount be election day. PSE itself has provided the bulk of that money, with smaller amounts donated by other for-profit utilities in the state, and an affiliated business group. Not one dollar has been contributed by a human being, and not one dollar has come from any person or group in Thurston County. Voters must ask themselves: Is our democracy for sale? Can we afford to allow any corporation to have this much influence on our local political system? A Grays Harbor PUD Commissioner back in the 1950′s was interviewed about the effects of bringing public power to that county. His answer surprised the interviewer. He didn’t cite lower rates or better service or local control as the biggest effect. He said the most important effect was “getting those S.O.B.s out of our local politics,” so they could no longer buy city councils, county commissioners or local legislators. Mayor Harding’s lack of support is misplaced because Proposition 1 has nothing to do with his concerns about rates, cost estimates, or not having enough information. A vote for Proposition 1 authorizes the Public Utility District (PUD) to provide electric service to Thurston County, yet does not obligate public officials to choose a PUD. When Proposition 1 passes, a complete a feasibility study will then be conducted to determine where and if public power will benefit the people of Thurston County. Of course Mr. Harding does not have enough information, because the voters have yet to authorize the full study that comes after approval of Prop. 1. Based on information provided from that study, local government representatives (City Councils, County Commissioners) will then choose the best option to serve their constituents, negotiate with the chosen provider, and reach an agreement to provide electricity. I am really concerned that the boatload of money being thrown against Prop. 1 by a multinational corporation who owns our area’s 100-year-plus monopolistic electric supplier has affected our misread elected officials, muddying the waters of public opinion with their misinformation. Proposition 1 is a referendum on public choice for electric power supply – the feasibility study, cost comparisons and public debate will come once the voters approve Prop. 1. “Voting “Yes” on Thurston County Proposition 1 is the only way you will ever have a choice of who supplies your electricity. It starts the process of self-determination and gives us the option to get out from under PSE’s monopoly. This is a recording from Thursday 18 October 2012, originally broadcast on KAOS 89.3 FM radio program, Parallel University. Thank you to Grays Harbor PUD Commissioner Tom Casey, KAOS Radio, Parallel University, and Molly Gibbs, Olympia Move to Amend, for hosting the show while Kim Dobson was away on other business. Grays Harbor PUD Commissioner Tom Casey was interviewed at the Sept. 27th League of Women Voters forum at the Washington Center. He very succinctly and powerfully explains the historic importance — for the entire state — of the Thurston Public Power Initiative. Public Power Week – An American Tradition that Works! That’s right. Oct. 7-13 is Public Power Week. Let’s make it a week we can celebrate every year, by urging all our friends and neighbors to vote “Yes” on Proposition 1! Steve Klein, prominent Yelm citizen and widely-read community-affairs blogger, sat down with John Pearce, public power campaign chair, for a discussion of Proposition 1. Isn’t it better to have a choice? A “Yes” vote on Thurston County Proposition 1 is a vote to give Thurston County residents a choice: another option besides the foreign-owned monopoly we have now. It’s simply a vote for alternatives. Publicly-supplied electricity already works well and serves 55% of Washington State residents with lower rates and more reliable service than we get from PSE. It works well in Mason, Lewis, Grays Harbor, Clark, Clallam, Snohomish, and in 16 other counties. It also works in Tacoma, McCleary, Centralia, and Seattle. As a volunteer member and Chair of Thurston Public Power Initiative, my goal is to see that Thurston County residents get a choice. 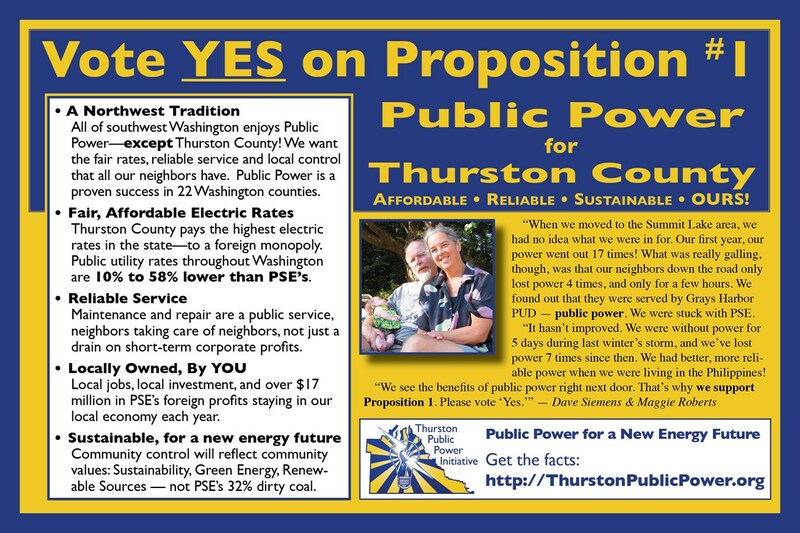 When approved, Thurston County Proposition 1 gives us a possible alternative to PSE’s 100+ year electric monopoly. It allows any local government approving body—the County Commission or any of the City Councils—to consider public power on behalf of their constituents. Do you agree that the #1 responsibility of any government body is to work in the public interest? Then vote “Yes” for Proposition 1 and make sure your government has the ability to choose what is best for you. Upon approval, Thurston County Proposition 1 authorizes the Public Utility District (PUD) to provide electric service to Thurston County, but does not obligate them. They will then research and complete a feasibility study to determine where and when public power might benefit the people of Thurston County. Local government representatives (City Councils, County Commissioners) will then choose the option best suited to serve their constituents and negotiate with the chosen provider and reach an agreement on a franchise (permission and rights) to provide electricity. This will be paid for with revenue bonds which are backed by the electric revenues to be collected. There is no additional debt to the residents. Your current electric bill includes payment for PSE debt, so it would be like switching from renting to buying the system, because public power systems are owned by the residents. There are many places for residents to weigh in along this path, both at the public PUD meetings and at your local government’s public meetings. 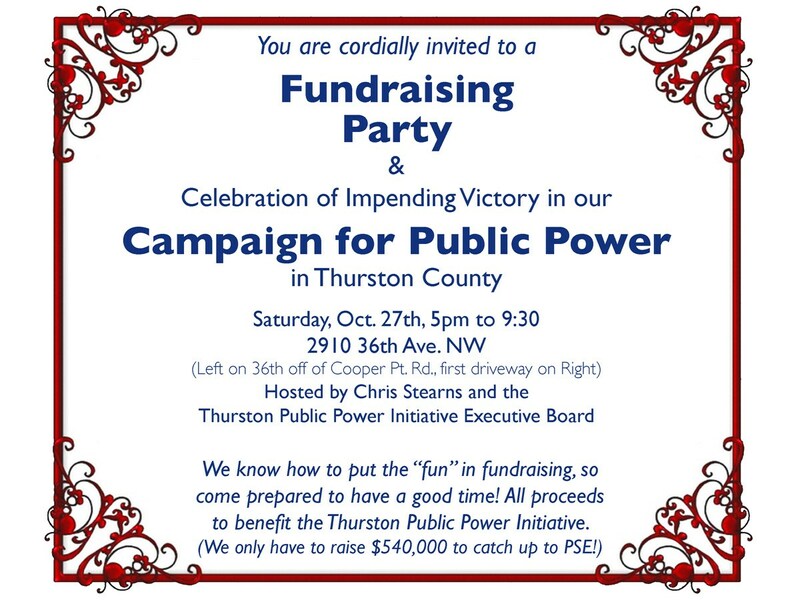 We of the Thurston Public Power Initiative will be there with you, supporting what is best for Thurston County—even if it means waiting on public power. Voting “Yes” on Thurston County Proposition 1 is the only way you will ever have a choice of who supplies your electricity. It starts the process of self-determination and gives us the option to get out from under PSE’s monopoly. Tom Nogler’s outstanding letter to the editor to The Olympian can be found here. I urge voters to beware of the many distortions presented by Puget Sound Energy and their hired operatives in their efforts to defeat Proposition 1, the public power initiative. PSE greatly inflates the price of its system in Thurston County to frighten the public. The Washington state Department of Revenue reports the total appraised value of PSE’s Thurston County assets at $131.2 million. If PSE’s assets are truly worth what they claim, they are paying less than their share and taking away funds from Thurston County schoolchildren, police and firefighters. PSE is not a good corporate citizen. It is owned and run by a large multi-national corporation that sucked $17 million in profit out of Thurston County in 2011. They then brag about donating 0.003 percent of this profit to charities. PSE wants you to believe that the public is not ready for public power, that the economy is not strong enough to make an investment in public power. Well-known local musician, producer, business owner — and Chamber of Commerce member — Calvin Johnson recently penned an excellent article on his company’s (K Records) website. 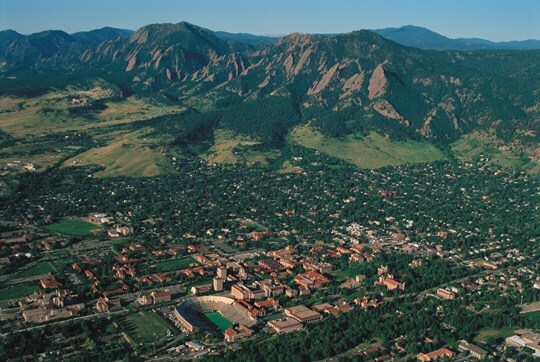 The article addressed both the short-sightedness of the Chamber’s decision, and the importance of local economic sustainability, which the Proposition 1 campaign represents. We’ve reprinted the article here on our website, though of course we encourage you to visit the K Records site, where you can read the original — and check out one of Olympia’s most dynamic and creative businesses. Olympia, WA—The Thurston Public Power Initiative is calling on Governor Chris Gregoire to take a second look at Thurston County Proposition 1, the public power initiative. On Monday, October 08, political consultants for Puget Sound Energy released a statement from Washington Governor Christine Gregoire where she stated her opposition to Thurston County Proposition 1. This measure will be on November’s ballot. If passed by voters it would allow Thurston Public Utility District (PUD) to enter the electric utility business. Proposition 1 does not mandate any particular use of that authority. However, Thurston PUD recently released a report on three possible options for using cheap federal power to provide limited service in Thurston County. One option called for providing service to the Olympia core area, including the Capital Campus.